These brightly colored and durable plastic sand and water toys for sandbox, tub, pool, beach or daycare and preschool use. Sand and water mill is great fun in the yard or at the beach. Load water or sand into the funnel, pull the slide release and watch the wheels turn and the tip. 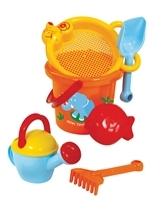 Happy George is great fun for the sandbox or the beach! Set includes everything needed for a day of fun. This 26" sand rake is super strong! 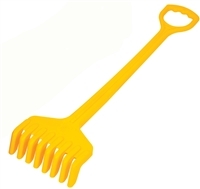 Set of 2 strong sand shovels, 22" and 16". Make perfect sand bricks every time! Water mill has working pump and spinner. Water and sand mill has dual spinners.